China ordered local governments to report outbreaks of avian influenza and other animal diseases within four hours of discovery to China's cabinet, the State Council, as bird flu spreads in the country. Under the new rules, county and city governments must report animal epidemic outbreaks to the provincial government within two hours, the State Council said in a statement issued yesterday through the official Xinhua News Agency. The regulation aims to "control and stamp out major epidemic cases to ensure the safety of the breeding industry, protect people's health and lives, and to safeguard the social order,'' the statement said. Officials who fail to comply will be demoted or fired, and may be prosecuted, it said. So the county, city, provincial and the State Council will find out quickly. But will the citizens or the rest of the world find out? 1. Pay attention to controlling the amount of reporting on the situation of Highly Pathogenic Avian Influenza (HPAI). Make sure that the coverage intensity fluctuates so that the matter is not hyped up. 2. The publishing of related articles must be carefully examined. 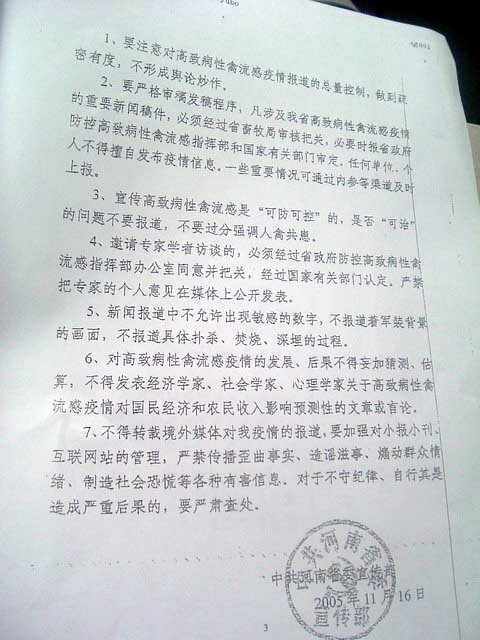 All important news articles about the HPAI situation in our province must be passed through our provincial Animal Farming Department; if necessary, the articles must also be passed by the provincial Center for Disease Control HPAI Command Center as well as related national departments. No unit or individual can release reports about the epidemic on their own. Certain important situations can be reported upwards through Internal Reference and other channels of communication. 3. Propagandize that HPAI is "preventable as well as controllable." Do not report on the problem of whether it is "curable" or not. Do not over-emphasize that both humans and animals can be infected. 4. When experts are interviewed, the provincial Center for Disease Control HPAI Command Center must give approval and be present, and then the reports must be approved by the related national departments. The personal opinions of experts are not allowed to be published in the media. 5. The reports should not contain sensitive figures. There must not be pictures showing military uniforms. There must not be detailed reports about the culling, cremation and deep burial. 6. There must not be speculations and forecasts about the development of HPAI. There must be no reports or speeches from economists, sociologists and psychologists concerning the impact of the HPAI epidemic on the national economy and the incomes of farmers. 7. Foreign reports concerning the situation of the epidemic shall not be relayed. The smaller newspapers and magazines as well as websites must be supervised more tightly. There must not be any dissemination of distorted facts, chaos-causing rumors, and harmful information that inflame public emotions and cause social panic. All those who ignore discipline and go their own way so as to cause serious consequences will be investigated and punished severely. "Have the chicken in your home been compulsorily vaccinated? Please show me your vaccination record." This is what Shaanxi province deputy governor Wang Shousen's asked at a chicken grower Shi Shunxian home at Jingyag county emergency response drill against the avian flu epidemic. First, he inspected to see the conditions of the chickens and then he asked whether the chickens have been vaccinated. Shi replied, "No." Wang Shousen asked Shi to produce the vaccination record, but he took out the "Feeding Management Handbook" that was given to him when he purchased the nestlings. 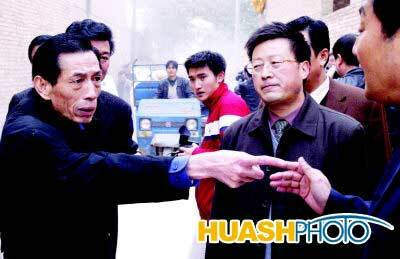 In order to verify that the avian flu vaccination had been done, Wang Shousen halted the viewing of the drill. Instead, he randomly visited two more chicken growers. He was surprised to find that the Department of Animal Farming had not been there to perform compulsory vaccination and there were no vaccination records. Wang Shousen angrily told the accompanying cadres: "Why don't you devote your energy in doing solid and practical work instead of just passing through in form?" In front of the audience, Wang harangued individual local cadres: "You people eat the royal family's food but you do nothing!" Afterwards, Wang held an emergency meeting. He emphasized once again: the various levels must clearly grasp the importance of controlling the avian flu and not be blindly hopeful that they will get lucky and get by. They have to think about the politics and the big picture to handle this work. They must treat this as a top priority for the Department of Animal Farming; they must start with the details, especially about the compulsory vaccinations; they must start enforcing compulsory vaccination even in those farms with only 100 chickens; the cadres must enter the villages and enter the homes; they must have observers and they must keep files on the vaccinations; they must form terms with from the Department of Animal Farming and the village/town cadres to investigate those villagers with large numbers of chicken breeders and direct them to observe hygiene; the cities, counties and districts should let the province to purchase vaccines; at the same time, they must designate responsibility and establish an accountability system to make sure that the flu control is implemented correctly and according to standards. If anything should happen, then the responsible persons will be severely sanctioned no matter who they are.